Home / Celebrities & Gossip / Entertainment / Kenya / Snake!! Is this Huddah trying to apologize to Zari after allegedly sleeping with Diamond? Snake!! 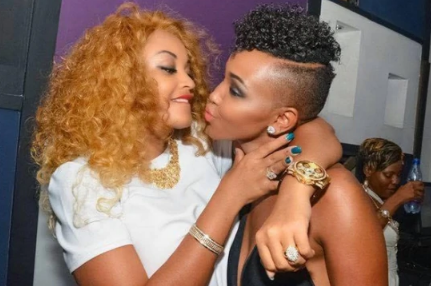 Is this Huddah trying to apologize to Zari after allegedly sleeping with Diamond? Socialite Huddah Monroe and Zari Hassan used to be good friends but along the way, they fell out and few have never understood what really happened behind closed doors. Monroe however confessed she bedded Diamond Platnumz and that’s when Zari was really into the guy. Since then they haven’t talked but now Huddah has come out to share that she misses her good friend. Speaking in an interview on Wasafi TV the controversial socialite confessed that she misses Zari and doesn’t know what really happened to their friendship. Fans believe that’s a snake move because she has secretly confessed of thirsting for Diamond. Several times on social media Zari has shunned her for trying to mess around with her ex. “Me and Zari we were very close. We were very good friends, were used to talk about issues personal sana. Sasa zingine I still miss her as my friend, because alikuwa ananiambia sana vitu zake personal, na ningetaka hata kuexpose vitu zake social media, ningeexpose, akini I have never because she was a very good friend, I feel like she is still a good friend, because mimi sina issue nay eye, and I feel even her deep down hana issue na mimi,” she said.